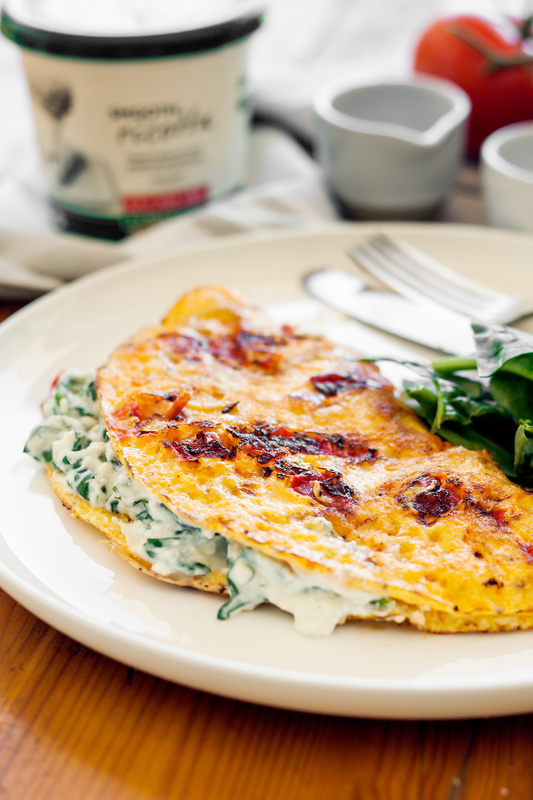 This simple ricotta and spinach omelette ticks many boxes for a quick light and healthy breakfast. With well over 30g of protein, this omelette is great for maintaining healthy muscle mass. 1 Whisk eggs in a small bowl until combined. Season with salt and freshly ground black pepper. 2 Place spinach in a medium saucepan with small amount of butter over medium heat. Cook for 2 minutes or until almost wilted. Take off the heat and cool slightly. 3 Add the Smooth Ricotta to the spinach and stir to combine. Be sure not to cook the Ricotta over high heat or it will go runny. Season as desired. 4 Lightly spray a small (18cm base) non-stick frying pan with oil and heat over medium-high heat. Add the tomato and fry until softened. Pour the egg into pan and cook for 30 seconds or until the base of the omelette is set. Using a spatula, draw the edge of the omelette into the centre and allow the uncooked mixture to run underneath. Continue doing this until the egg mixture is nearly set. 5 Spread the spinach and ricotta over half of the omelette. Fold omelette over to enclose filling. Transfer to a serving plate.